Mayo scored three second-half goals to clinch a 3-11 to 2-10 comeback victory over Kerry in the Football League Division One decider. Kerry led 2-3 to 0-5 at the break with Gavin Crowley and Stephen O'Brien netting for the Kingdom. Mayo fought back and goals from Matthew Ruane and Diarmuid O'Connor helped them into a one-point lead. 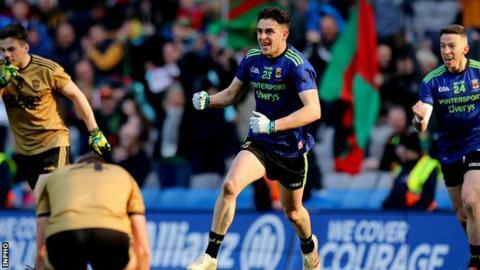 Ciaran Treacy added the third in added time as Mayo secured a first league title since 2001. It was all going to plan for Kerry at the break with Crowley hitting the opening goal on 13 minutes to move them in front. The second Kingdom three-pointer came 13 minutes and it was a fine finish from O'Brien to open up a five-point advantage. That lead was reduced to just one when Ruane found the back of the Kerry net on 49 minutes. Mayo were still trailing when O'Connor diverted the ball into the net from a high Paddy Durcan delivery with five minutes left. A second yellow card saw Mayo's Aidan O'Shea sent off and Rob Hennelly made am impressive save to deny Kingdom forward David Clifford before Treacy struck to seal the win. There was still time for Kerry's Diarmuid O'Connor to be dismissed as a red card followed a black. Also on Sunday, Limerick added the Hurling League title to their All-Ireland crown by beating Waterford 1-24 to 0-19 at Croke Park. Aaron Gillane hit 1-9 for the winners as they never trailed, having led 1-12 to 0-10 at half-time.